Brooklyn, NY - Two major Jewish organizations were among the recipients of more than half a million dollars in funding from Brooklyn Borough Hall, announced Borough President Eric Adams at a press conference held today in front of the NYPD’s 90th Precinct in Williamsburg. Flanked by a group of at risk high schoolers who take part in a unique mentoring program with officers at the 90th Precinct, Adams presented symbolic checks earmarked for safety improvements, including security cameras, to the United Jewish Organizations of Williamsburg and the Sephardic Community Center. Adams observed that security cameras have proven to be an effective tool in the fight against crime. “Security cameras deter crime, prevent crime and insure the immediate apprehension of those who are participating in crime,” said Adams, who noted that the cameras are intended to stem the growing incidence of hate crimes in New York City. 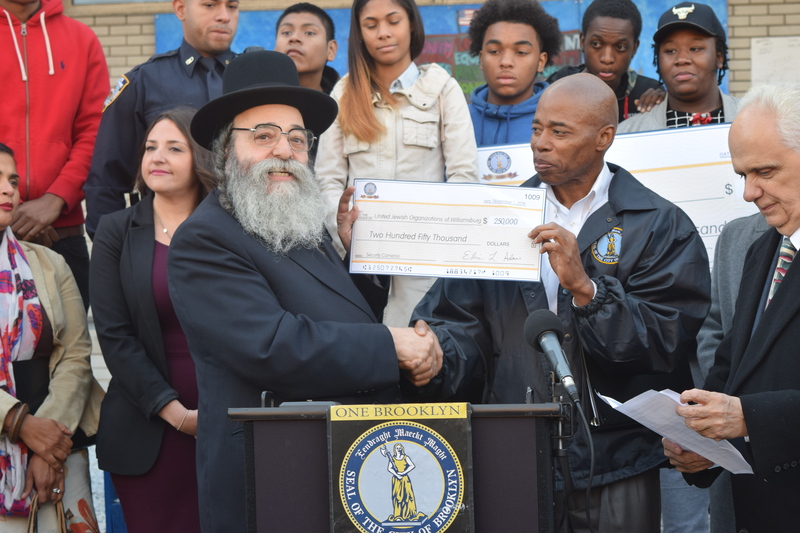 Rabbi David Niederman accepted a $250,000 check on behalf of the UJO of Williamsburg which will go directly to the NYPD to fund security cameras in the 90th Precinct. Rabbi Niederman noted that Menachem Stark had been kidnapped just blocks away from the spot where the press conference was taking place and said that perhaps if more surveillance cameras had been in place the Stark case could have been solved sooner. “These cameras, Mr. Borough President, these cameras, Mr. Lentol, will ensure that if a crime is committed you will be able to immediately go back and trace the tracks,” said Rabbi Niederman. The impact of the security cameras could be far reaching suggested Rabbi Niederman. “This is not only prevention, not only keeping criminals off the streets, but it may save some lives,” said Rabbi Niederman. 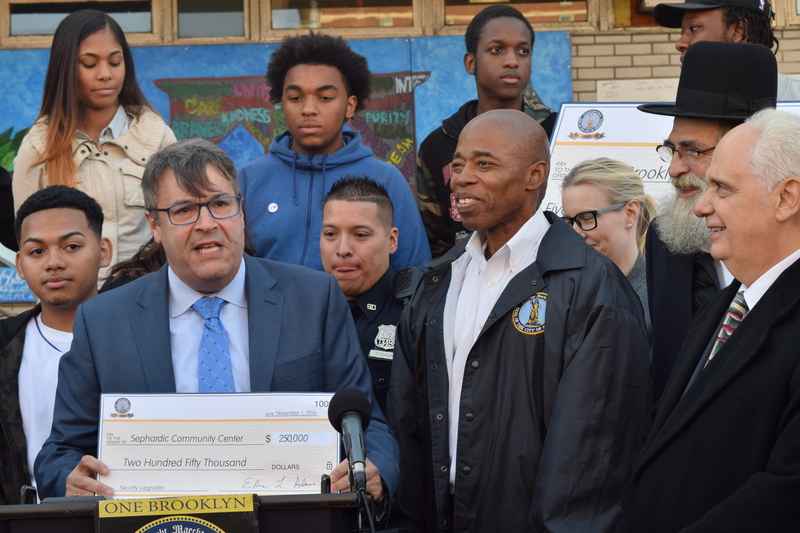 Gary Lipman, CEO of the Sephardic Community Center on Ocean Parkway accepted a $250,000 check from Adams and spoke about the foreign and domestic safety threats that imperil community institutions. “Through the generous contribution and grant from the city we will be able to assure that our facility, which welcomes thousands of New Yorkers, thousands of Brooklynites into it every single day will be safe and that the children who come into our building will be safe, that the senior citizens who come into our building will be safe and that every citizen in Brooklyn who uses the Sephardic Community Center will be safe,” said Lipman. Adams also presented a check for $37,000 to NYC Together, which will be used to create a multimedia learning center for at risk teens inside the 90th Precinct. I wonder how much Satmar gave BP Adams to his election campaign - or what they will give to his re-election. Quid pro quo? Meanwhile....I would never have recognized the BP if not for the caption, & I have met with him several times. He looks very sick & emaciated. Hope he is OK, he is a decent guy.